This kid has every right to channel his despair and rage into activism, and people who smear him and his like-minded peers are grotesquely off-base. That doesn't make his gratuitous insult here any less contemptible, on the merits. Maybe he'll come to regret hurling it one day. As I wrote shortly after a deranged leftist extremist attempted to massacre Congressional Republicans on a baseball field last year, blaming anyone other than the gunman for what happened represented a cheap and unfair effort to score political points. "Rhetoric" was not to blame. Bernie Sanders, whom the shooter ardently supported, was not to blame. The gun was not to blame. The exact same standard should apply to Parkland. The fault for that catastrophe lies with the evil and disturbed perpetrator, not with America's many millions of law-abiding gun owners, nor the people who defend our citizenry's fundamental constitutional right to bear arms. I fully understand the frustration pro-gun control forces harbor for political actors whom they view as impediments to needed reforms. Some (but not all) of that partisan frustration is misguided, in my view, and sometimes acts as a lazy substitute for thinking through harsh realities that don't fit into an easy box. But channeling anger at politicians who stand in the way of one's desired outcome makes intuitive sense. Rubio was asked about reimposing the so-called "assault weapons" ban, the repeal of which did not lead to an increase in gun crime (just the opposite, in fact). His answer explained why, in actual practice, such a law would not work -- and how in order to have the desired effect, the government would need to ban every semi-automatic rifle in America. Most of the crowd burst into cheers. 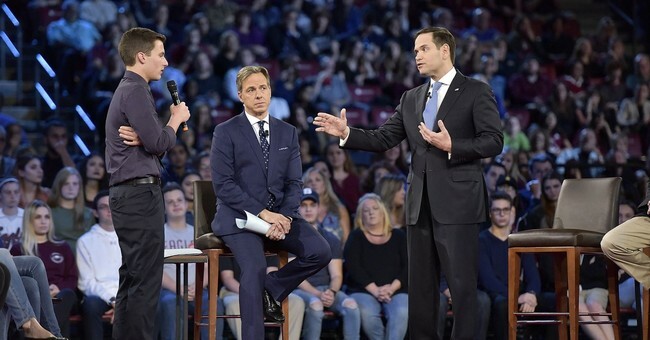 This was hailed as a powerful anti-gun moment and an embarrassment for Rubio, but it was neither. Whenever we debate gun control as a nation, most of the Left (some people are more explicitly honest about their intentions) insists that it's fear-driven paranoia that leads 'bitter clingers' to believe that the government is going to outlaw their guns. We're not coming to ban your guns, they say. We just want to implement a few 'common sense' restrictions like universal background checks (which already apply to the overwhelming majority of gun purchases). Gun owners and Second Amendment adherents are instinctively skeptical and suspicious of this line. I can't remember a piece of media that so explicitly exemplifies all the worst fears pro-gun forces agitate against. That clip is going to be run on a loop for the next three years. Putting aside politics & policy, minors who have been through this much trauma should be talking to mental health professionals at least as much as they are to anchors & reporters. This kind of grief is not to be trifled with. Okay Dems, you heard the cheers of the crowd. Time to introduce a full semi-automatic ban bill.